We at Deckstainhelp.com offer tips for more than staining decks. In this article, we offer our insight on which stains are the best for log cabins. We always appreciate your input, so feel free to leave a comment below with pictures of your log cabin stain projects. For 2019, TWP 1500 Series and the Restore-A-Deck Wood Stain are two excellent examples of log cabin stains. There is no doubt that a log cabin is a thing of beauty in most any type of landscape. 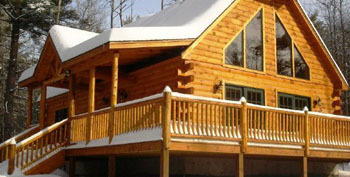 To keep a log cabin looking good and lasting for many years, maintenance is key. Log cabins can be very high maintenance and homeowners know all to well the tedious task of keeping it in good condition.